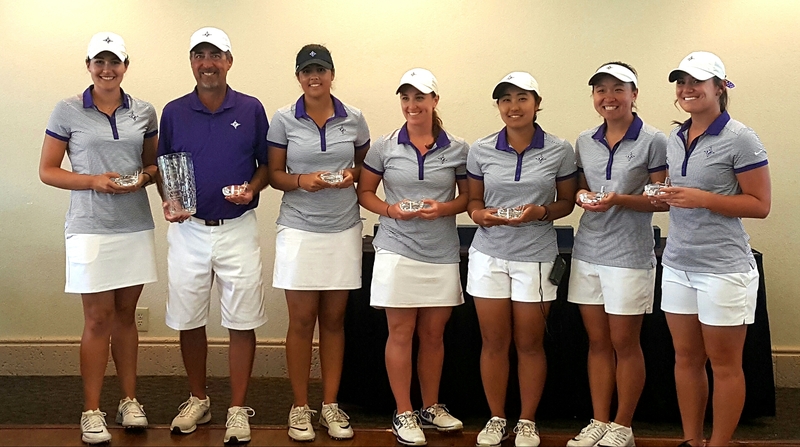 HAIL TO THE CHAMPIONS: Furman’s women won their second tourney of the season at St. Lucie Trail. PORT ST. LUCIE, Florida — We received a great inside look at women’s college golf when we volunteered to host a player participating in the Central District Invitational on the St. Lucie Trail course here. What an eye-opening experience it was! Michigan State University hosted the tournament, and the players on all 14 participating schools were housed by local residents like us. Our player was Alice Chen, a junior at Furman University in South Carolina. Not only was she a delightful houseguest, she also proved a great player in winning her first-ever college tournament. (Alice had already been crowned the New Jersey Women’s Amateur champion). Alice and I have something in common as far as our golf games go. After most of our tee shots our playing partners say `Nice drive, Alice.’’ Just a joke, folks. Furman head coach Jeff Hull and individual champion Alice Chen had plenty to celebrate at the Central District Invitational. 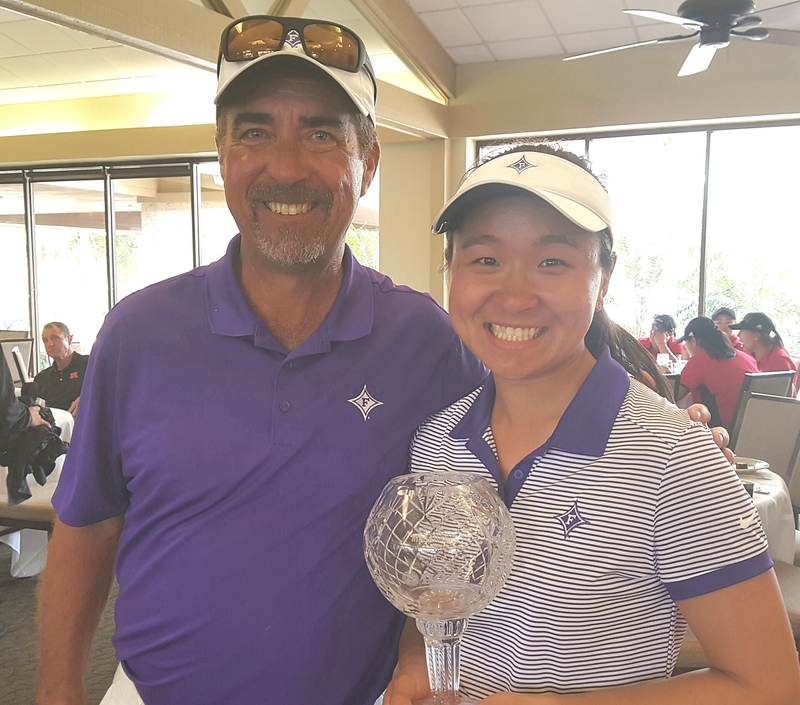 Furman was also the run-away winner of the team title at St. Lucie Trail, much to the delight of two of the school’s most celebrated golfing alumni – LPGA legends Beth Daniel and Betsy King. Also on hand was another LPGA great, Meg Mallon. I’ve watched plenty of women’s golf over the years (four U.S. Women’s Opens, four Legends Championships, a flock of LPGA Tour events and 21 Illinois Women’s Opens), but not much at the major college level. When flying isn’t a necessity this is how the Furman women’s team gets to its tournaments. 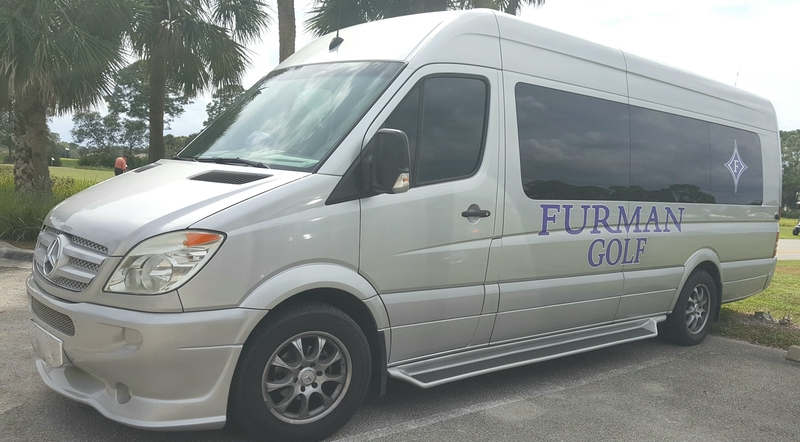 Hull drove his team to Port St. Lucie – a 9 ½ -hour drive – in a luxury Mercedes tour bus with reclining leather seats, surround sound, flat-screen TV and disco lights. I’d say that was traveling in style. The team played at a high level as well, posting an even par 864 in winning by 23 strokes over second place Memphis. Louisville, North Carolina and Maryland rounded out the top five. The Furman team arrived in late afternoon on Saturday, played a practice round on Sunday, then endured a 36-hole session on Monday before Tuesday’s final round. It was all walking golf with most of the players using push or pull carts. Some, though, carried their bags all 54 holes. 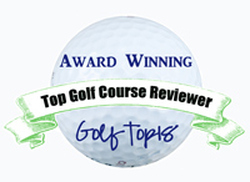 That made for a good physical test, and St. Lucie Trail is (my opinion) the most difficult of the four courses that encompass PGA Golf Club – the winter home for the PGA of America’s 28,000 members. Furman has a long way to go before it can win the NCAA title at Rich Harvest Farms, but the Paladins – if they get there – will visit a course big in the history of women’s golf. 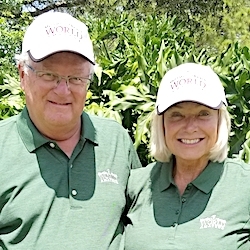 Owner Jerry Rich hosted one of the most successful-ever Solheim Cup matches there in 2009 when Daniel captained the U.S. team to victory. Alice Chen shows her winning form on her final tee shot of the Central District Invitational.